A late disputed goal gave Slaughtneil a dramatic victory over holders Ballinderry in Sunday's Derry Club final at Celtic Park. Ballinderry had looked as though they would hang on for a fourth title in a row but Gerald Bradley's three-pointer gave Slaughtneil a 1-8 to 0-9 victory. Slaughtneil captain Francis McEldowney reacts to his team's dramatic win over Ballinderry in the Derry club final. In the Antrim final at Ahogill, St Gall's defeated Cargin by 1-11 to 0-10. 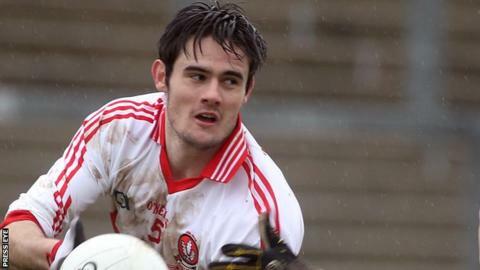 It was a 13th title in 14 years for Carl McCabe's men and they now face Contibret in the Ulster Championship. Monaghan champions Clontibret pulled off a last-gasp victory over Kilcoo of Down to progress to the provincial last eight. The Derry showdown between Ballinderry and Slaughtneil was a tempestuous affair - and it ended in controversy as the Shamrocks were adamant the ball had not crossed the line for that late match-winning goal. It came when Chris Brennan's lofted sideline delivery came down on the edge of the square. The ball was diverted goalwards and it squeezed under Ballinderry keeper Mickey Conlan. Despite the protests, the umpires said the ball had crossed the line and it meant a two-point success for underdogs Slaughtneil.